<?xml:namespace prefix = st1 ns = "urn:schemas-microsoft-com:office:smarttags" />Wednesday, October 21, 2009. The reggae musician Louisa Marks, who has died aged 49 from a suspected food poisoning at her home in the Gambia, was the fearless school girl who changed the course of reggae music. Marks was arguably the Queen of Lover’s Rock – a sub-genre of reggae noted for its romantic sound and bluesy content. Lover's Rock was a product of the U.K. reggae scene and Marks was its first major star. The genre gained wider acceptance in the late 1970s as mainstream roots reggae increasingly devoted itself to political protest and Rastafarian spirituality. Marks and Lover's Rock - - fondly called "music to make love to" - blurred the lines to a greater extent than ever before, pairing the smooth sounds of Chicago and Philly soul with reggae basslines and rhythms. Marks' seminal work is perhaps her 1975 cover of Robert Parker’s classic “Caught You in a Lie”. That single, recorded when she was just 15, not only became synonymous with Lover’s Rock, the track also helped put Britain on the global reggae map. Her sweet vocal style and updated rock steady rhythms made her a household name among lovers of reggae music the world over. From the time that "Caught You in a Lie" was released, Lover's Rock became quite popular among Black Britons seeking an alternative to political reggae. While never quite prevalent in the spiritual home of reggae music Jamaica, Lover's Rock was adopted as an alternate style by several major roots-reggae figures, including John Holt, Gregory Isaacs, Dennis Brown, and Freddie McGregor, who used it to broaden their repertoires and appeal to wider audiences. 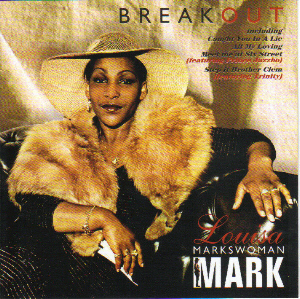 Louisa “Markswoman” Mark was born in Shepherd’s Bush, west London to parents of West Indian origin. Marks was a singing prodigy around her neighbourhood and was spotted in her early teens when she won various talent contests at the Four Aces Club in London. The sound-system operator and music producer Lloyd Coxsone took to her and gave Marks her first recording session at the Gooseberry Studio in London, from where “Caught You in a Lie” was recorded, with the singer Matumbi as the backing vocal. “Caught You in a Lie” quickly became an overnight sensation among reggae lovers the world over and the track has since been acknowledged as the first Lover’s Rock single. This was soon followed by another huge hit titled “All My Loving” - a cover of the Beatles' original of the same name. After these well-received tracks, Marks left music for 18 months partly because of contractual dispute and also to complete her education. After secondary school, Marks took to reggae full-time and she moved to a new label Trojan Records, where reggae music producer and manager Clem Bushay took her under his wing. "Keep it Like it is", another cover of an R'n'B classic was released in 1977. Again, the song was well-received, despite the fact that Marks thought it was poorly marketed. In 1978, Marks was voted top female reggae vocalist by fans, ahead of another legend Marcia Griffith. Marks soon became disillusioned with on-goings at Trojan Records and moved with Bushay to his newly-established record company Bushay. There, she covered Michael Jackson's "Even Though You're Gone", which also attained critical acclaim. This was followed by "Six Sixth Street" co-written by Bushay, Joe Charles and the reggae group The In Crowd. “Six Sixth Street” reached the number one spot in the chart in its first week of release. During those years of the late 1970s and the early 80s, Marks not only had success in terms of record sales, she also became a favourite in many black clubs across the UK at a time of great political difficulty for the community, although she herself was not overtly political. She released her first album “Breakout" in 1981, but once again was unhappy with the way this effort was marketed and refused to record for a year. In 1982, the single "Mum and Dad" was released but not to the same critical acclaim as in the past. "Hello There" released in 1984 suffered similar fate. Marks later became disillusioned with the recording industry and over the years concentrated on working with young producers. Some of them described her as bitter and eccentric, while many greatly appreciated her talent and contribution to the British reggae scene. Despite a strained relationship with the industry, Marks' influence on Lovers rock helped maintain the genre's popularity with its core urban audience in Britain and across the world into the 1990s, and while it remained a style that few artists pursued exclusively, it helped other artists such as Maxi Priest score several international hit singles. Louisa Marks died on Saturday, October 17, 2009, at her home in the Gambia.